Dubai, United Arab Emirates, 20 November 2018: Week 5 of the Dubai Sports Council Academies Championship witnessed strong play by the Girls U18 UAE National Team, as Team A rose to the top of the League table after closing the gap with the du LaLiga HPC Team. 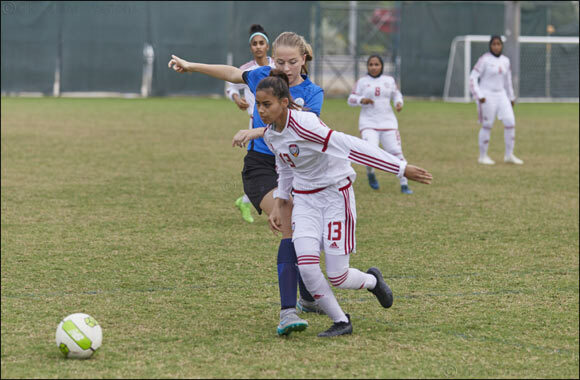 The Girls U18 UAE National Team B beat Regional Sports Academy 3-0 at Dubai Sports City to reach third place in the League table. In the Boys U18 category, du LaLiga HPC beat Spanish SS Iniesta 5-0 at the game played at Shabab Al Ahli stadium to maintain their position at the top of the League table. The match between AS Roma and Barca Academy ended in a draw and City FC beat LaLiga Academy 4-0. In the Boys U16 category, Go Pro beat FSC Foxes 4-0. du LaLiga HPC maintained their position at the top of the League table after beating Al Wasl Club Academy 3-0 at Dubai Sports City. In the Boys U14 category, City FC Red rose to the top of the League table this week after beating Talented Academy 6-0, while Al Wasl Club Academy rose to 2nd place in the League table after beating AD Elite 5-1. Spanish SS Iniesta maintained their position at the top of the League table in both the Boys U10 and U12 categories. On November 24th, Spanish SS Iniesta will face Solo FA and LaLiga Academy will face AD Elite in the U18 Boys Category at Shabab Al Ahli Dubai Club. In the U16 category, Go Pro will face Al Wasl Club Academy and LaLiga Academy will face Talented Academy at Dubai Sports City. The UAE National Team B and du LaLiga HPC Girls U18 will battle it out for the 2nd place position at Dubai Sports City. The Dubai Sports Council Academies Championship is the largest tournament of its kind, expanded this year to include 100 teams and 2300 players from private and local club academies. The tournament is played at Al Wasl Shabab Al Ahli and Dubai Sports City Stadiums and runs from October 20, 2018 to April 27, 2019.